Tomorrow morning, space shuttle Atlantis will be landing, winding up 30 years of the U.S. space shuttle program. If all goes as planned, STS-135 should touchdown on runway 15 at Kennedy Space Center at approximately 5:56 AM. People in Central Florida should hear its tell-tale sonic boom shortly before that time. 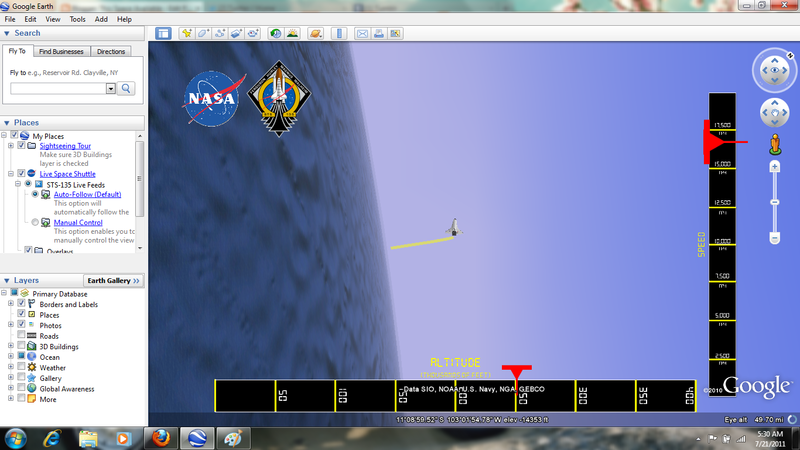 Watch this space for further updates as This Space Available will be liveblogging the reentry and landing as it occurs. 5:00 AM update: Watching NASA TV right now. Those following the landing in Central Florida should hear the twin sonic booms approximately three minutes before touchdown at 5:56 AM. Descent can also be followed on Google Earth in real time. Right now, Atlantis is above Australia. According to Mission Control, everything on Atlantis is functioning perfectly. According to NASA TV, Atlantis has traveled over 126 million miles in its career. That is nothing short of mind-blowing. 5:27 AM: Reentering now. Just above 300,000 feet. 5:29 AM: Closed loop banking has commenced to dissipate excess energy during reentry. The orbiter banked 70 degrees. It looked pretty wild on Google Earth. 5:40: Mach 19. Yep, that’s awfully fast. Now just above 200,000 feet. 5:42: Mach 17. Atlantis rolled 62 degrees to the right. Fifteen minutes from touchdown. Watching it on Google Earth has been pretty amazing. Reentry as seen via Google Earth. 5:47 AM: Mach 7. Coming over Florida. We should hear the boom-boom soon. 5:48 AM: Nine minutes until the U.S. space shuttle program ends. 5:50 AM: Six minutes…Mach 2.5. 5:52 AM: Shuttle is now visible in sky. 5:53 AM: Less than 50,000 feet. Around Mach 1. Three and a half minutes until touchdown. Heard the last sonic booms. Okay, grabbing the Kleenex now. 5:56 AM: One minute then it’s all over. This is it. 5:57 AM: Atlantis has touched down for the last time. Thank you NASA for 30 marvelous years. I am speechless. Me? I’m a tear-stained mess, and it was all worth it. I will put up touchdown pictures later today. 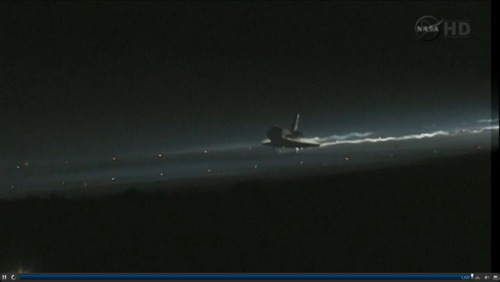 Screenshot of STS-135 landing from NASA TV.